Trickers Shoemaking from a family manufacturer in Northampton England since 1829. Extensive range of Trickers Footwear readily available from our stock, along with some Pediwear exclusives. Free Trickers Limewood Shoe Trees with non-sale Trickers footwearFree Shipping World Wide with all Trickers Non-Sale Footwear. Tricker`s exclusive range at Pediwear. We have taken some classic styles and added our own variations. A range which has proven popular with new and established Tricker's customers. Whether it be for fishing, shooting or just walking in the country, Trickers shoes and boots will offer the strength and ruggedness you require. This range of classic favourites and contemporary styles, using fine leathers on a modern last follows Tricker`s tradition of quality benchmade shoes. A range of Goodywear welted country styles for women from Trickers. All the sturdy luxury we have come to expect from Trickers in styles made on ladies' lasts. 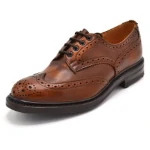 A wonderful opportunity to purchase Tricker's Shoes at special prices. Sign up now to keep yourself up to date with our news, promotions and seasonal offers. We are constantly watching other Shoe Web Sites to ensure that we always offer you the best deal. 24 Westgate, Halifax, West Yorkshire, HX1 1DJ. 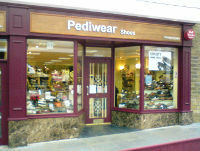 Pediwear is rated 4.9 out of 5 stars by Reviews.co.uk based on 5569 reviews.